Hard to reach nodes are likely in mesh networks. BlueNor BT832 Series Bluetooth 5 modules are the best solution for mass Bluetooth 5 deployment and for use in mesh networks. Develop your Bluetooth 5 products using BT832, a low cost Bluetooth 5 module with Cortex M4F, $5 each at 1 pcs. Upgrade with BT832F Bluetooth 5.0 module for 760 meters average range, at 7.5 mA peak current. Upgrade with BT832X (nRF52832 + power amplifier module) for 1140 meters average range. 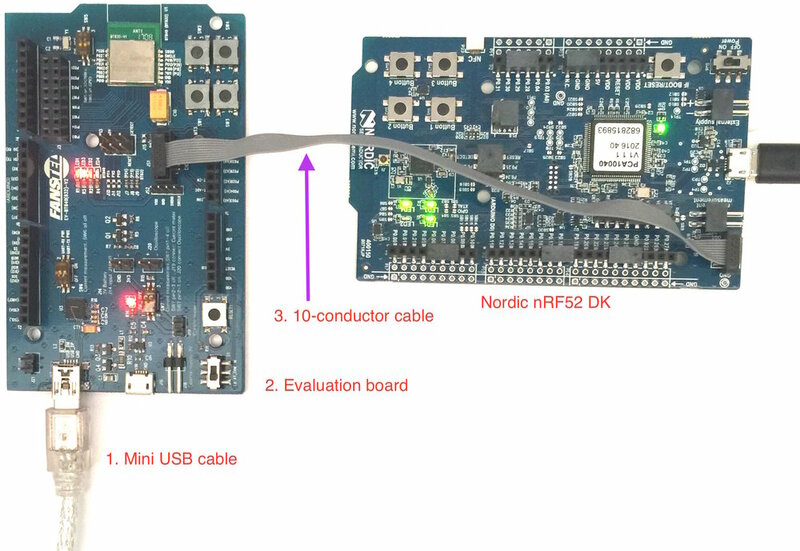 Upgrade with BT840F (nRF52840 module), Bluetooth 5, Thread, Zigbee, CryptoCell 310 co-processor, 2300 meters range at 125 Kbps, 13.6 mA peak current. Upgrade with BT840E (nRF52840 + u.FL module), Bluetooth 5, Thread, Zigbee, CryptoCell 310, 13.6 mA peak current. Upgrade with BT840 (nRF52840 module), a lower cost, smaller size, shorter range alternative of BT840F. Reduce cost by using BT832A (nRF52 810 Bluetooth 5 module), 192KB flash/24KB RAM, no NFC, $3.75 each at 1 pcs. Reduce cost and increase range by using BT832AF (nRF52810 module), 192KB flash/24KB RAM, no NFC, 760 meters average range. With Bluetooth 5 mesh network protocol stacks and BlueNor BT832 Series modules, no hardware redesign is needed to reach any node in mesh network. A host board design can accommodate all modules listed above. For wide area network, BT832X can be used in Relay node. For mesh networks with many nodes, BT840F with CryptoCell-310 co-processor is recommended for Relay node. As implementation examples, open source WiFi to Bluetooth 5 IoT gateways and Bluetooth 5 sensors are are available. With market ready enclosure, you can begin marketing WiFi to BLE IoT gateway or BLE 5 sensor upon completion of firmware and software development. 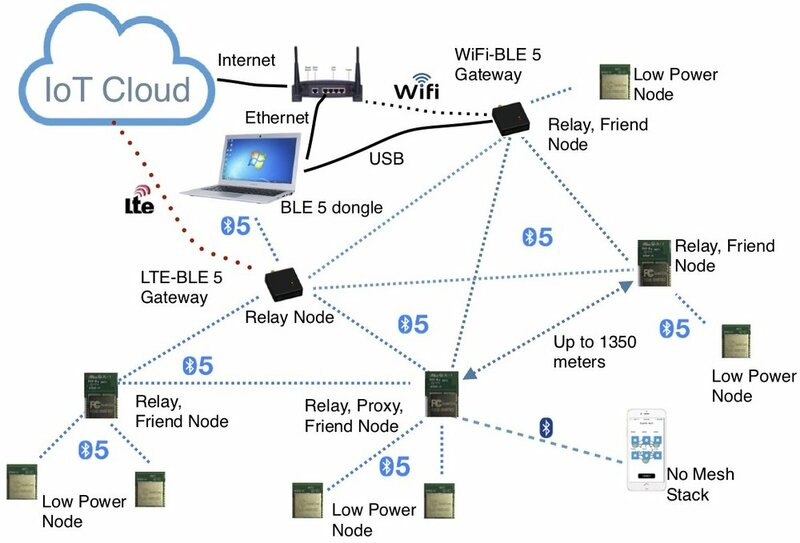 If you wish to develop your own products, use these WiFi to BLE IoT gateway and Bluetooth 5 sensor as examples for PCB layout, placement of mechanical components to reduce attenuation and interference of BLE signal for longer range. Bluetooth range measurement site, methods, and results for long range modules are available. To accommodate high performance antenna and power amplifier, physical sizes of BT832 Series are different. However, the soldering pad footprint is identical for all modules. BT840 Series' footprints are superset of that of BT832 Series. Bluetooth range, memories, and features can be upgraded by replacing module only. No change to main board hardware is required. Multiple versions of the same product can be made to meet various requirements for mass deployment in mesh networks. nRF52810, nRF52832, and nRF52840 Bluetooth 5 modules. Compatible foot prints. EV BT832 is preloaded with BlueNor nRF5x application and SoftDevice S132 V5.0.0 Bluetooth 5 stacks. It can be used with Android app BlueNor nrf5x available at Google Play Store. You can send commands from an Android phone to toggle LED light on evaluation board. You can also send button pressing signal from evaluation board to Android device. BT832 Bluetooth 5 module for $5 special starting at one pcs. Reel quantity (1K pcs), $4.46 each.